Well hello! It's been a productive few weeks! I LOVE focusing on things that have sat on the to do list for way too long. It's so easy for me to see the shiny new project and let little things go for a stupid amount of time. I'm over that though, and have vowed to start knocking more off my list. This one was in our master bathroom -- lately I've been asked a few times to share more bathroom projects. I've completely redone two bathrooms in our home (the powder room and basement bathroom from scratch), but haven't tackled the two larger bathrooms for a few reasons. One, because it will be expensive. I just finished that kitchen. ;) Two, it will be a big inconvenience to go without one of those bathrooms and three, I take forever to figure out exactly what I want. I'm pretty sure where I'm going with my son's bathroom and will tackle that first. Our master bath is not really my style at all anymore but it will most likely be the last room I make over in our home (for all the reasons above). It's a nice bathroom and it functions well. It is my dream bathroom? No, but I don't' even know what my dream bathroom is yet. ;) And I want to put money where we spend more time. This is a very old photo but it's the best before I could find. I shared how I did that textured stencil here -- it really was a cool project. That stuff stayed put for all these years! (I'm sure it helps that this isn't exactly a high traffic area.) But for a couple years I've been wanting to remove that texture. I think it's a cool result but it's just not my style anymore. My taste has become a lot less fussy over the years. It wasn't hard -- just took some elbow grease. That got any residue that was left. If I really wanted to scrub I think I could have gotten it all off with that, but my arms were really tired at this point. ;) There was absolutely no damage to the walls! It helps that I painted this area with semi gloss -- it takes scrubbing much better. Best tip ever -- when you're caulking something like this, tape it off first, then you can make a big mess as you're wiping it down and it won't get all over everything. Remove the tape while the caulk is still wet. So I finally got that back in place and attached the trim again. 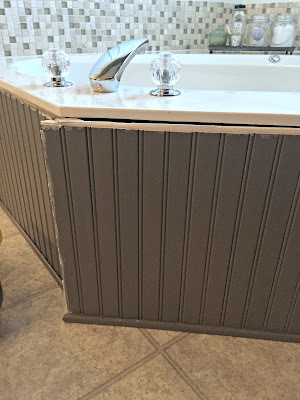 Side note -- I covered our tub panels with beadboard a long time ago and they've held up great. I painted them to match the room and I still love that little bit of detail. It was a super easy and cheap project! But we both love a good soak so we'll be keeping a tub, I just don't want to keep this ginormous one. Lots of ideas floating around up in the noggin. Good thing I've got plenty of time to think about it! It took me an afternoon to get this all finished up -- again, this was one of those projects that was going to take all day in my head. That happens a lot. :) I'm hoping to get a few more knocked out over the weekend, but full disclosure -- I spent money on knobs at Hobby Lobby yesterday. They were on sale and I wanted to grab them at 50 percent off. Otherwise I've been pretty dang great at not buying anything for the house! 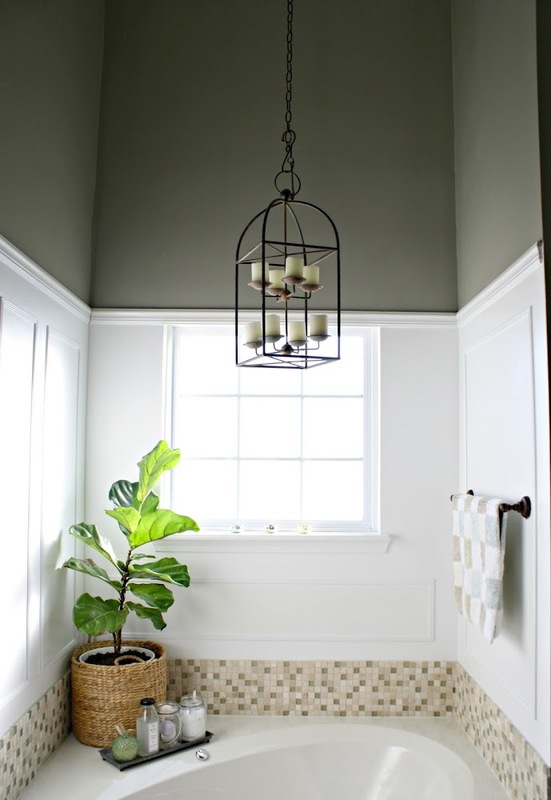 Have you made big or small changes to your bathroom? Did you wait a long time like us? I just haven't had the urge to do much more with this room yet -- but I know that will change eventually. I love the way it looks. Great job! It has a nice spa feel. We're getting ready to knock out our bathroom. It's dated to 1967. It has a blue tub and sink. Lol. Can't wait to get it finished. It looks GREAT! And thank you for that awesome tape-before-caulking-tip!! I will use that one for sure. 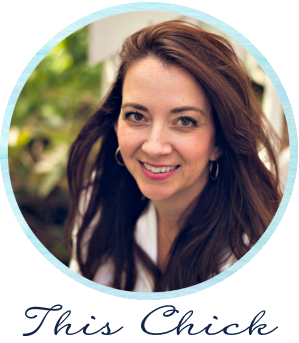 :) Always enjoy your blog, Sarah. Wow! That came out so good it actually looks like a totally remodeled bathroom. Very nice! Good choice to get rid of that texture detail, but the molding looks great! 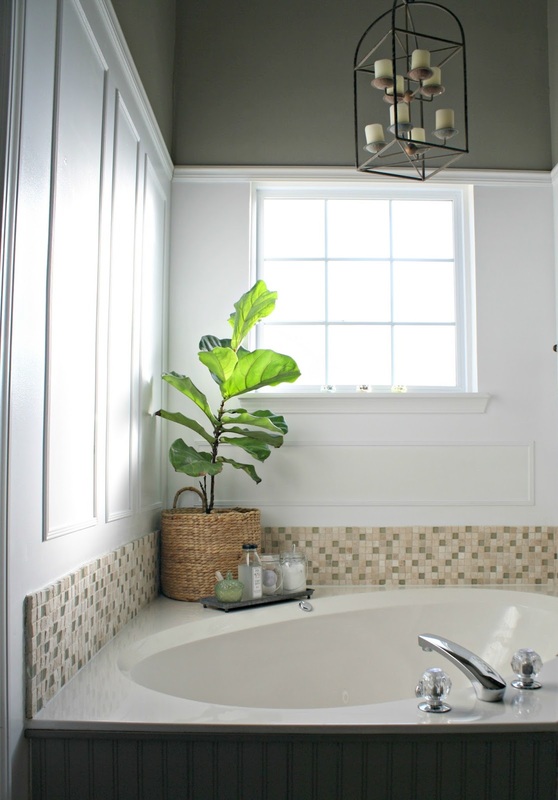 Are you planning to paint the tub surround white? I think that'd look really clean and lighten it up from the dark floors. Love the clean lines and simpler look. Great job! Soooooo pretty!! Add bubble bath, candles, and wine and it's the absolute perfect way to end the night!! This is such a great makeover!!! I mean it's like night & day. I also loved that you kept some of the original tile it looks like.. which makes it soo much more practical!! It's so fresh & simple spa like now..VERY NICE JOB!!! Looks great. 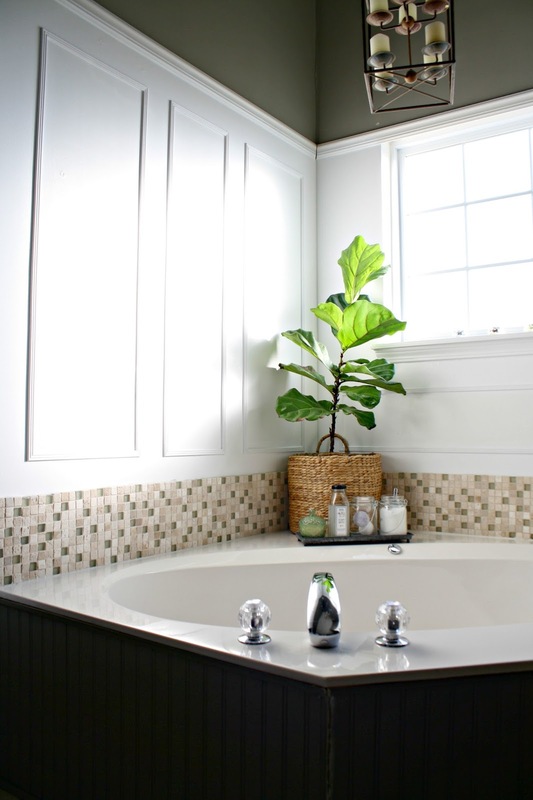 Have you considered painting the bead board around the tub white? This looks so relaxing. The candles, that lighting fixture, the colors; it all just works perfectly. It looks so serene and spa like! You could relax in that tub for hours before or after a luxurious massage. Kind of amazing, because your stencils were very cool, but I really like the "after" appearance too! Looks so fresh and sleek. Interesting. ps-after seeing that TALL photo of Bub, I'm guessing you need to keep a lot of food in the house these days! I like the new, calming look of your bathroom:) I am in the middle of a complete redo of my master bathroom. I have been tiling the shower for two days and I am looking forward to the finished space! Love the space! Your home is so inspiring! 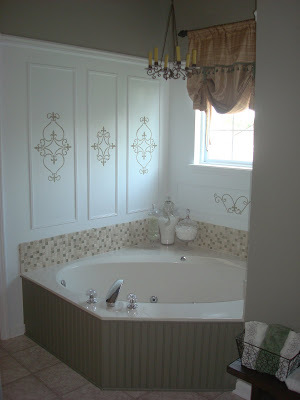 I have a similar tub area and I never thought of a candle light fixture. Can you share where you found yours? Thank you!! !